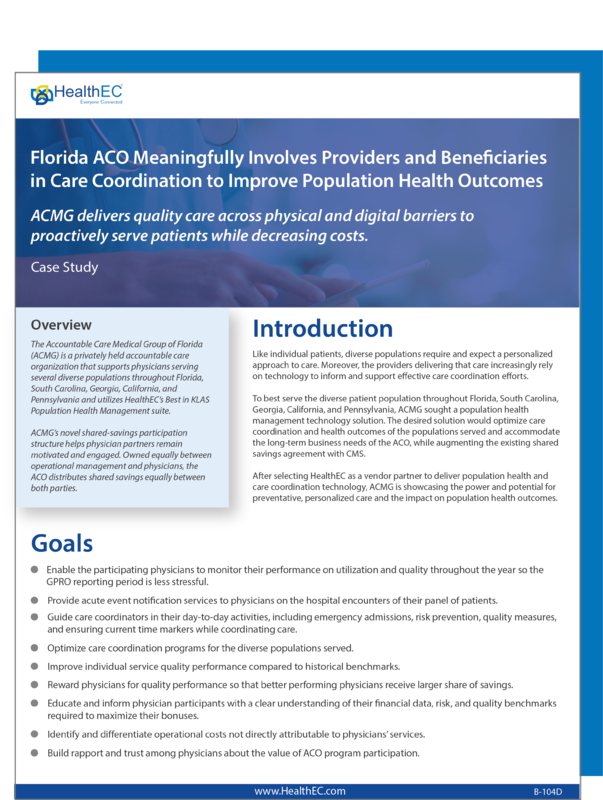 Florida ACO delivers quality care across physical and digital barriers to proactively serve patients while decreasing costs. ACMG saves more than $9 million annually using HealthEC's population health and care coordination technology. Goals: ACMG wanted a solution that would optimize care coordination and health outcomes for its diverse patient population and accommodate the long-term business needs of the ACO, while augmenting the organization's existing shared savings agreement with CMS. Solution: ACMG selected HealthEC's population health management solution based on the platform's comprehensive services and ability to adapt to the evolving needs of the organization. Request our Case Study to learn more. HealthEC, LLC is a leading innovator and KLAS-recognized Population Health Management Company dedicated to improving patient outcomes, managing costs and optimizing patient quality of life for the customers we serve.